Fearless optimist Anna sets off on an epic journey-teaming up with rugged mountain man Kristoff and his loyal reindeer Sven-to find her sister Elsa, whose icy powers have trapped the kingdom of Arendelle in eternal winter. Encountering Everest-like conditions, mystical trolls and a hilarious snowman named Olaf, Anna and Kristoff battle the elements in a race to save the kingdom. The standup is 45 inches tall and 18 inches wide. He is Olaf and he likes warm hugs. 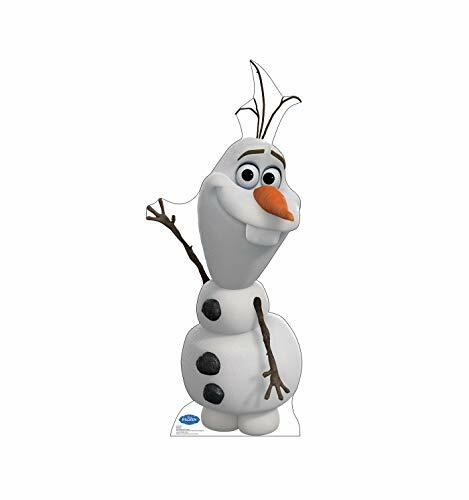 Sprung from Elsa's magic powers, Olaf is by far the most friendly snowman to walk on the mountains above Arendelle. His innocence, outgoing personality and uncanny ability to disassemble himself at good and not-so-good times lead to some awkward, albeit laughable moments. He may also have the world's most impossible dream, but what he doesn't know won't melt him-or will it? How to Set Up Your Standup: 1. Unfold standup and easel. Lay standup face down on a clean, flat surface. 2. Fold easel up along the long vertical crease that runs the length of the standup. 3. Lift upper and lower tab to lock easel in place. 4. Attach upper tab to top of easel. About Advanced Graphics: Since 1984, Advanced Graphics has been committed to producing the highest quality Cardboard Standups and Custom Prints in the world. We are the worldwide industry leader in the licensing and distribution of Cardboard Standups. We are also the #1 source for Licensed and Custom cardboard standups in the industry. Our goal is to provide the highest quality prints to our customers. We put our customers first and will continue to provide the best customer service to those who keep us in business. - WOW: Make Any Special Event Or Party Spectacular With The Coolest Decorations. Wow Your Loved Ones With A Unique Gift That They Will Remember For Years! Display As A Prop At Trade Shows, Performances, Plays, Holidays And More. - MADE IN AMERICA: Proudly Manufactured In The USA. HIGH QUALITY: Advanced Graphics Produces The Highest Quality Cardboard Standups And Custom Prints In The World.